You need to come back. You was supposed to keep that to yourself JW. and yes you need to come back sometime. To each their own , but I prefer splitting and grinding them, simply because they are easier for me to deal with when putting on an arrow. 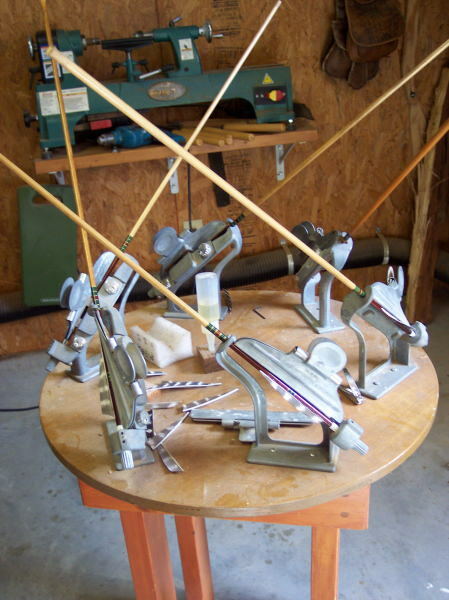 As for a grinding clamp; I use a Jo-Jan straight fletching clamp with the fixture that holds it in the jig ground off. You can see it in this picture lying on my fletching table, I use it on a sanding block while fletching if I have a feather with an extra thick quill that needs a little thinning. I also use it if I cut my own fletching for shaping the quill on my belt sander. Can you strip goose feathers? I thought that only worked with turkey. I havn't managed to accumulate enough goose feathers to try them. You can strip any feathers if they are not too dry. If they are you can rehydrate them. OK, good to know. Now I just need to remember to go out looking for molted goose feathers next June. I mean, who is too proud to take free fletchings? I like to throw the geese some wholegrain bread when I do collect feathers. Maybe I'm too proud, but I feel I've done a good honest trade then. Mon arc, mon cœur. Gardez la foi. Page created in 1.228 seconds with 27 queries.